* For the adage cf. Erasmus, Adagia 2.9.53 (Obsequium amicos, veritas odium parit). Its ultimate source is Terence, Andria 68. John Hudson was born in 1662 in the village of Widehope near to Cockermouth (Cumberland). In 1676 he began to study as a servitor in Queen’s College in Oxford. He obtained M.A. degree in 1684. From 1686 he was fellow and tutor of University College, lecturing on various subjects of philology, but when in 1691 he was elected master of the same college, he was given a reputation of being contrary to the government. Therefore he changed his cautious Jacobite views, but nevertheless he was not allowed to step forward. In 1701, following the dismissal of Thomas Hyde (1636-1703), he was elected librarian of Bodleian Library, and in the same year he obtained his doctoral degree in theology. He had already donated seventy books to the library, these were followed by six hundred more between 1705 and 1710. In 1712 he appointed sub-librarian Thomas Hearne (1678-1735), who was a nonjuror, and therefore was dismissed in 1716, but at this time he reproached Hudson of having betrayed his former principles. Hudson was not a model librarian, and this reputation of him was further exaggerated by his enemies. He was told for example to have thrown out a book of poetry by Milton, donated to the library by the poet himself back in 1647, and the volume survived only by chance. In 1712 Hudson was elected principal of St. Mary Hall in Oxford; he built the house where principals dwell since then. 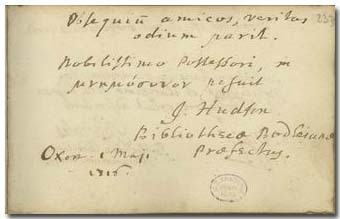 He published a large number of classical authors, among them the volume of Thucydides conserved in our Library: Thoukydidou peri tou Peloponnesiakou polemou biblia okto … quam Aemilius Portus … repurgavit, Graec. & Lat. Oxford, 1696. – Dionysii Halicarnassensis Opera omnia Graece et Latine. Oxford, 1704. 2 tom. – Dionysiou Longinou peri hypsous biblion, Graec. & Lat. Oxford, 1710. – Geographiae veteris scriptores Graeci minores. Oxford, 1698-1712. 4 tom.